Backyard Foraging: 65 Familiar Plants You Didn't Know You Could Eat by Ellen Zachos is a collection of weeds as well as commonly grown garden and landscaping plants that are edible and not generally grown for food. It's written for people who have recently started foraging or who have been doing it only for a short time and would like to know more about what is edible and ways to prepare it. Full color photographs and lots of information written in an easy to follow conversational fashion make it a very accessible book for people who are just starting out. The plants cover a fairly wide range of regional zones. It starts with learning how to identify plants to be safe and how to harvest in an ethical way, and then talks about how to harvest in a way that doesn't destroy the appearance of your garden and landscaping. 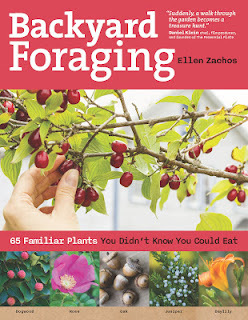 It explains about young shoots, foraging flowers, nuts and fruits and digging for edible roots. It also has a great section on the tools you'll need to enjoy your harvest. Getting into the plants, each plant is described completely and has both the common name and the Latin name listed. The text explains how to harvest, and which parts of the plants are edible, and how they are best eaten. It will also show dangerous lookalikes and how to tell the difference. It's sectioned by types of edibles. The first section is leaves and stems that are edible. This includes things like chickweed and miner's lettuce that can be eaten raw in a salad as well as things like fern fiddleheads that are best cooked. The next section covers edible fruits and flowers. This covers crabapples and highbush cranberries as well as things like juniper berries, roses and prickly pears. Next up, nuts and seeds- I'm really impressed with the authors attention to detail about harvesting throughout the book, but this is where it's handiest. Nuts can be hard to harvest and she explains very well about how to harvest and prepare the nuts. After that, roots, tubers and rhizomes (generally the stuff that is underground)- there are plants you expect to find like wild garlic, but also a lot of flowers that have edible roots and bulbs. The last regular plant chapter is those superstar plants like my favorite dandelions that are almost all edible. It explains how each part of the plant that is edible might be eaten from root to flower. Then comes the easy to identify 5 safe mushrooms- everyone who forages and likes mushrooms should become knowledgeable about these. She explains the dangers of mushroom hunting and why mushrooms should always be cooked. Then she shows how to identify spored, gilled and toothed mushrooms. After that, she introduces the reader to 5 kinds of mushrooms that are very easy to identify and safe to eat. The last chapter covers cooking and recipes for your harvest. It discusses preservation techniques and has some great recipes for jams and jellies. It also has recipes for baked goods, soups and other dishes. It's very well indexed, and this a book that I happily recommend to anyone who is beginning at foraging and wildcrafting. I've been an active forager for years, and found some things in it that I'd forgotten about or that I didn't know. Published by Storey Publishing- check out their Facebook page for lots of great contests, recipes and ideas. Oh, that is a must buy for this household. I will link through here when I come back for it later!